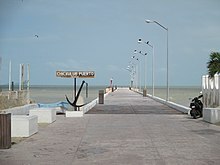 For the town and municipality, see Chicxulub, Yucatán. The Chicxulub crater (/ˈtʃiːkʃʊluːb/; Mayan: [tʃʼikʃuluɓ]) is an impact crater buried underneath the Yucatán Peninsula in Mexico. 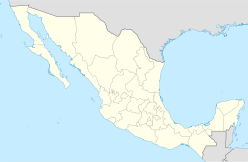 Its center is located near the town of Chicxulub, after which the crater is named. It was formed by a large asteroid or comet about 11 to 81 kilometres (6.8 to 50.3 miles) in diameter, the Chicxulub impactor, striking the Earth. The date of the impact coincides precisely with the Cretaceous–Paleogene boundary (K–Pg boundary), slightly less than 66 million years ago, and a widely accepted theory is that worldwide climate disruption from the event was the cause of the Cretaceous–Paleogene extinction event, a mass extinction in which 75% of plant and animal species on Earth became extinct, including all non-avian dinosaurs. The crater is estimated to be 150 kilometres (93 miles) in diameter and 20 km (12 mi) in depth, well into the continental crust of the region of about 10–30 km (6.2–18.6 mi) depth. It is the second largest confirmed impact structure on Earth and the only one whose peak ring is intact and directly accessible for scientific research. Gravity anomaly map of the Chicxulub impact structure. The coastline is shown as a white line. A striking series of concentric features reveals the location of the crater. White dots represent water-filled sinkholes (solution-collapse features common in the limestone rocks of the region) called cenotes after the Maya word dzonot. A dramatic ring of cenotes is associated with the largest peripheral gravity-gradient feature. The origin of the cenote ring remains uncertain, although the link to the underlying buried crater seems clear. In 1978, geophysicists Glen Penfield and Antonio Camargo were working for the Mexican state-owned oil company Petróleos Mexicanos, or Pemex, as part of an airborne magnetic survey of the Gulf of Mexico north of the Yucatán peninsula. Penfield's job was to use geophysical data to scout possible locations for oil drilling. In the data, Penfield found a huge underwater arc with "extraordinary symmetry" in a ring 70 km (40 mi) across. He then obtained a gravity map of the Yucatán made in the 1960s. A decade earlier, the same map suggested an impact feature to contractor Robert Baltosser, but he was forbidden to publicize his conclusion by Pemex corporate policy of the time. Penfield found another arc on the peninsula itself, the ends of which pointed northward. Comparing the two maps, he found the separate arcs formed a circle, 180 km (110 mi) wide, centered near the Yucatán village Chicxulub; he felt certain the shape had been created by a cataclysmic event in geologic history. Pemex disallowed release of specific data but let Penfield and company official Antonio Camargo present their results at the 1981 Society of Exploration Geophysicists conference. That year's conference was underattended and their report attracted scant attention. Coincidentally, many experts in impact craters and the K–Pg boundary were attending a separate conference on Earth impacts. Although Penfield had plenty of geophysical data sets, he had no rock cores or other physical evidence of an impact. He knew Pemex had drilled exploratory wells in the region. In 1951, one bored into what was described as a thick layer of andesite about 1.3 kilometres (4,300 ft) down. This layer could have resulted from the intense heat and pressure of an Earth impact, but at the time of the borings it was dismissed as a lava dome—a feature uncharacteristic of the region's geology. Penfield tried to secure site samples, but was told such samples had been lost or destroyed. When attempts at returning to the drill sites and looking for rocks proved fruitless, Penfield abandoned his search, published his findings and returned to his Pemex work. At the same time, in 1980, geologist Walter Alvarez and his father, Nobel Prize-winning scientist Luis Walter Alvarez, put forth his hypothesis that a large extraterrestrial body had struck Earth. In 1981, unaware of Penfield's discovery, University of Arizona graduate student Alan R. Hildebrand and faculty adviser William V. Boynton published a draft Earth-impact theory and sought a candidate crater. Their evidence included greenish-brown clay with surplus iridium containing shocked quartz grains and small weathered glass beads that looked to be tektites. Thick, jumbled deposits of coarse rock fragments were also present, thought to have been scoured from one place and deposited elsewhere by a megatsunami resulting from an Earth impact. Such deposits occur in many locations but seem concentrated in the Caribbean basin at the K–Pg boundary. So when Haitian professor Florentine Morás discovered what he thought to be evidence of an ancient volcano on Haiti, Hildebrand suggested it could be a telltale feature of a nearby impact. Tests on samples retrieved from the K–Pg boundary revealed more tektite glass, formed only in the heat of asteroid impacts and high-yield nuclear detonations. In 1990, Houston Chronicle reporter Carlos Byars told Hildebrand of Penfield's earlier discovery of a possible impact crater. Hildebrand contacted Penfield in April 1990 and the pair soon secured two drill samples from the Pemex wells, stored in New Orleans. Hildebrand's team tested the samples, which clearly showed shock-metamorphic materials. A team of California researchers including Kevin Pope, Adriana Ocampo, and Charles Duller, surveying regional satellite images in 1996, found a cenote (sinkhole) ring centered on Chicxulub that matched the one Penfield saw earlier; the cenotes were thought to be caused by subsidence of bolide-weakened lithostratigraphy around the impact crater wall. More recent evidence suggests the actual crater is 300 km (190 mi) wide, and the 180 km ring is in fact an inner wall of it. An animation showing the impact, and subsequent crater formation (University of Arizona, Space Imagery Center). Researchers at the University of Glasgow dated tektite samples from the impact as 66,038,000 ± 11,000 years old. joules, the yield of 50 megatons of TNT). The object dug a hole 100 kilometres (62 mi) wide and 30 kilometres (19 mi) deep, leaving a crater mainly under the sea and covered by 600 metres (2,000 ft) of sediment by the 21st century. The impact would have caused a megatsunami over 100 metres (330 ft) tall that would have reached all the way to what are now Texas and Florida. The height of the tsunami was limited by the relatively shallow sea in the area of the impact; in deep ocean it would have been 4.6 kilometres (2.9 mi) tall. A cloud of super-heated dust, ash and steam would have spread from the crater as the impactor burrowed underground in less than a second. Excavated material along with pieces of the impactor, ejected out of the atmosphere by the blast, would have been heated to incandescence upon re-entry, broiling the Earth's surface and possibly igniting wildfires; meanwhile, colossal shock waves would have triggered global earthquakes and volcanic eruptions. Fossil evidence for an instantaneous die-off of diverse animals was found in a soil layer only 10 centimetres (3.9 in) thick in New Jersey some 5,000 kilometres (3,100 mi) away from the impact site, indicating that death and burial under debris occurred suddenly and quickly over wide distances on land. The emission of dust and particles could have covered the entire surface of the Earth for several years, possibly a decade, creating a harsh environment for living things. The shock production of carbon dioxide caused by the destruction of carbonate rocks would have led to a sudden greenhouse effect. Over a decade or longer, sunlight would have been blocked from reaching the surface of the Earth by the dust particles in the atmosphere, cooling the surface dramatically. Photosynthesis by plants would also have been interrupted, affecting the entire food chain. A model of the event developed by Lomax et al. (2001) suggests that net primary productivity (NPP) rates may have increased to higher than pre-impact levels over the long term because of the high carbon dioxide concentrations. In February 2008, a team of researchers led by Sean Gulick at the University of Texas at Austin's Jackson School of Geosciences used seismic images of the crater to determine that the impactor landed in deeper water than was previously assumed. They argued that this would have resulted in increased sulfate aerosols in the atmosphere. According to the press release, that "could have made the impact deadlier in two ways: by altering climate (sulfate aerosols in the upper atmosphere can have a cooling effect) and by generating acid rain (water vapor can help to flush the lower atmosphere of sulfate aerosols, causing acid rain)." This was borne out by the results of a drilling project in 2016 which found that sulfate-containing rocks found in the area were not found in the peak ring (the rocks found were from deep within the earth's crust instead), the interpretation being that they had been vaporized by the impact and dispersed into the atmosphere. A long-term local effect of the impact was the creation of the Yucatán sedimentary basin which "ultimately produced favorable conditions for human settlement in a region where surface water is scarce." The piece of clay, held by Walter Alvarez, that sparked research into the impact theory. The greenish-brown band in the center is extremely rich in iridium. In their 1991 paper, Hildebrand, Penfield and company described the geology and composition of the impact feature. The rocks above the impact feature are layers of marl and limestone reaching to a depth of almost 1,000 m (3,300 ft). These rocks date back as far as the Paleocene. Below these layers lie more than 500 m (1,600 ft) of andesite glass and breccia. These andesitic igneous rocks were only found within the supposed impact feature, as is shocked quartz. The K–Pg boundary inside the feature is depressed to 600 to 1,100 m (2,000 to 3,600 ft) compared with the normal depth of about 500 m (1,600 ft) measured 5 km (3 mi) away from the impact feature. Along the edge of the crater are clusters of cenotes or sinkholes, which suggest that there was a water basin inside the feature during the Neogene period, after the impact. The groundwater of such a basin would have dissolved the limestone and created the caves and cenotes beneath the surface. The paper also noted that the crater seemed to be a good candidate source for the tektites reported at Haiti. In September 2007, a report published in Nature proposed an origin for the asteroid that created the Chicxulub crater. The authors, William F. Bottke, David Vokrouhlický, and David Nesvorný, argued that a collision in the asteroid belt 160 million years ago resulted in the Baptistina family of asteroids, the largest surviving member of which is 298 Baptistina. They proposed that the "Chicxulub asteroid" was also a member of this group. The connection between Chicxulub and Baptistina is supported by the large amount of carbonaceous material present in microscopic fragments of the impactor, suggesting the impactor was a member of a rare class of asteroids called carbonaceous chondrites, like Baptistina. According to Bottke, the Chicxulub impactor was a fragment of a much larger parent body about 170 km (106 mi) across, with the other impacting body being around 60 km (37 mi) in diameter. In 2011, new data from the Wide-field Infrared Survey Explorer revised the date of the collision which created the Baptistina family to about 80 million years ago. This makes an asteroid from this family highly improbable to be the asteroid that created the Chicxulub crater, as typically the process of resonance and collision of an asteroid takes many tens of millions of years. In 2010, another hypothesis was offered which implicated the newly discovered asteroid P/2010 A2, a member of the Flora family of asteroids, as a possible remnant cohort of the K/Pg impactor. 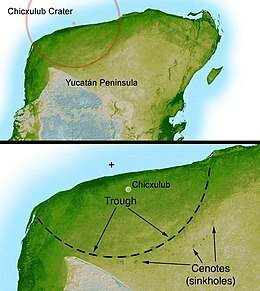 The Chicxulub Crater lends support to the theory postulated by the late physicist Luis Alvarez and his son, geologist Walter Alvarez, that the extinction of numerous animal and plant groups, including non-avian dinosaurs, may have resulted from a bolide impact (the Cretaceous–Paleogene extinction event). Luis and Walter Alvarez, at the time both faculty members at the University of California, Berkeley, postulated that this enormous extinction event, which was roughly contemporaneous with the postulated date of formation for the Chicxulub crater, could have been caused by just such a large impact. The age of the rocks marked by the impact shows that this impact structure dates from roughly 66 million years ago, the end of the Cretaceous period, and the start of the Paleogene period. It coincides with the K–Pg boundary, the geological boundary between the Cretaceous and Paleogene. The impact associated with the crater is thus implicated in the Cretaceous–Paleogene extinction event, including the worldwide extinction of non-avian dinosaurs. This conclusion has been the source of controversy. In March 2010, forty-one experts from many countries reviewed the available evidence: 20 years' worth of data spanning a variety of fields. They concluded that the impact at Chicxulub triggered the mass extinctions at the K–Pg boundary. In 2013 a study compared isotopes in impact glass from the Chicxulub impact with the same isotopes in ash from the boundary where the extinction event occurred in the fossil record; the study concluded that the impact glasses were dated at 66.038 ± 0.049 Ma, and the deposits immediately above the discontinuity in the geological and fossil record was dated to 66.019 ± 0.021 Ma, the two dates being within 19,000 years of each other, or almost exactly the same within experimental error. The theory is now widely accepted by the scientific community. Some critics, including paleontologist Robert Bakker, argue that such an impact would have killed frogs as well as dinosaurs, yet the frogs survived the extinction event. Gerta Keller of Princeton University argues that recent core samples from Chicxulub prove the impact occurred about 300,000 years before the mass extinction, and thus could not have been the causal factor. However, this conclusion is unsupported by radioactive dating and sedimentology. The main evidence of such an impact, besides the crater itself, is contained in a thin layer of clay present in the K–Pg boundary across the world. In the late 1970s, the Alvarezes and colleagues reported that it contained an abnormally high concentration of iridium. Iridium levels in this layer reached 6 parts per billion by weight or more compared to 0.4 for the Earth's crust as a whole; in comparison, meteorites can contain around 470 parts per billion of this element. It was hypothesized that the iridium was spread into the atmosphere when the impactor was vaporized and settled across the Earth's surface amongst other material thrown up by the impact, producing the layer of iridium-enriched clay. Similarly, an iridium anomaly in core samples from the Pacific Ocean suggested the Eltanin impact of about 2.5 million years ago. A more recent discovery is believed to demonstrate evidence of the scope of the destruction from the impact. In a March, 2019 article in the Proceedings of the National Academy of Sciences, an international team of twelve scientists revealed the contents of a site discovered near Bowman, North Dakota that appeared to show a devastating mass destruction of an ancient lake and its inhabitants at the time of the Chicxulub impact. In the paper, the group claims that the geology of the site is strewn with fossilized trees and remains of fish and other animals. The lead researcher, Robert A. DePalma of the University of Kansas, was quoted in the New York Times as stating that “[Y]ou would be blind to miss the carcasses sticking out... It is impossible to miss when you see the outcrop.” Evidence correlating this find to the Chicxulub impact included tektites bearing "the unique chemical signature of other tektites associated with the Chicxulub event" found in the gills of fish fossils and embedded in amber, an iridium-rich top layer that is considered another signature of the event, and an atypical lack of scavenging of the dead fish and animals that suggested few other species survived the event to feed off the mass death. The exact mechanism of the site's destruction has been debated as either an impact-caused tsunami or lake and river seiche activity triggered by post-impact earthquakes, though there has yet been no firm conclusion upon which researchers have settled. In recent years, several other craters of around the same age as Chicxulub have been discovered, all between latitudes 20°N and 70°N. Examples include the disputed Silverpit crater in the North Sea, and the Boltysh crater in Ukraine. Both are much smaller than Chicxulub, but are likely to have been caused by objects many tens of meters across striking the Earth. This has led to the hypothesis that the Chicxulub impact may have been only one of several impacts that happened nearly at the same time. Another possible crater thought to have been formed at the same time is the larger Shiva crater, though the structure's status as an impact crater is contested. The collision of Comet Shoemaker–Levy 9 with Jupiter in 1994 demonstrated that gravitational interactions can fragment a comet, giving rise to many impacts over a period of a few days if the comet should collide with a planet. Comets undergo gravitational interactions with the gas giants, and similar disruptions and collisions are very likely to have occurred in the past. This scenario may have occurred on Earth at the end of the Cretaceous, though Shiva and the Chicxulub craters might have been formed 300,000 years apart. In late 2006, Ken MacLeod, a geology professor from the University of Missouri, completed an analysis of sediment below the ocean's surface, bolstering the single-impact theory. MacLeod conducted his analysis approximately 4,500 kilometres (2,800 mi) from the Chicxulub crater to control for possible changes in soil composition at the impact site, while still close enough to be affected by the impact. The analysis revealed there was only one layer of impact debris in the sediment, which indicated there was only one impact. Multiple-impact proponents such as Gerta Keller regard the results as "rather hyper-inflated" and do not agree with the conclusion of MacLeod's analysis, arguing that there might only be gaps of hours to days between impacts in a multiple-impact scenario (cf. Shoemaker-Levy 9) which would not leave a detectable gap in deposits. Chicxulub is the only known Earth crater with a remaining impact peak ring, but it is under 600 m (2,000 ft) of sediment. During April and May 2016, a joint IODP-ICDP Mission Specific Platform Expedition no. 364 obtained the first offshore core samples from the peak ring, the central zone of the crater. During Expedition 364, DES drillers on the L/B Myrtle collected core samples to enable ECORD Science Party members to study how the peak ring formed and calculate the total impact energy. Their target depth was 1,500 m (4,900 ft) below the bottom of the ocean, but they reached an acceptable 1,335 m (4,380 ft). Sample preparation and analysis are being performed at Bremen, Germany. It was announced in November 2016 that pink granite, usually found deep in the Earth's crust, had been found in drilling samples. It suggests the impact was so great it shocked and melted rocks found deep in the crust, causing them to shoot up before falling back down to produce the peak rings. The granite samples were also found to be lighter and weaker than normal granite, a result of the shock and extreme conditions of the impact. The findings confirmed that the rock comprising the peak ring had originated deep in the earth, and was ejected to the surface. It had been subjected to immense pressures and forces and had been melted by heat and shocked by pressure from its usual state into its present form in just minutes; the fact that the peak ring was made of granite was also significant, since granite is not a rock found in sea-floor deposits, originating much deeper in the earth, and had been ejected to the surface by the immense pressures of impact. Gypsum, a sulfate-containing rock that is usually present in the shallow seabed of the region, had been almost entirely removed and likely vaporized to enter the atmosphere, an event immediately followed by a megatsunami sufficient to lay down the largest-known layered bed of sand, around 100 m (330 ft) deep and separated by grain size, directly above the peak ring. These types of sand deposits are caused by extreme water movement, where the larger and heavier sand grains settle first, followed by lighter and smaller grains. Taken together, analyses indicate that the impactor was large enough to create a 190-kilometre (120 mi) peak ring, to melt, shock and eject granite from many kilometres within the earth, to create colossal water movements, and to eject an immense quantity of vaporized rock and sulfates into the atmosphere, where they would have persisted over years to decades. This global dispersal of dust and sulfates would have led to a sudden and catastrophic effect on the climate worldwide, large temperature drops, and devastated the food chain. The researchers stated that the impact generated an environmental calamity that extinguished life, but it also induced a vast subsurface hydrothermal system that became an oasis for the recovery of life. A program on British television in 2017 described that the drilling revealed, from top down: thick Cenozoic limestone; a graded sediment deposit from one tsunami, over 100 m (330 ft) thick; the impact melted basement granite from the Earth's midcrust and shocked quartz. The peak ring itself did not contain the calcium sulphate that the rocks in the area around contain, leading the program makers to conclude that all the calcium sulphate in the crater area had been vaporized into the atmosphere and had become a dense sulphur dioxide veil stopping the sunlight. As additional clues of the resulting megatsunami represented in a New Jersey quarry, a dense marine bone bed was found on the Cretaceous–Paleogene boundary containing a mixture of dead sea animals with little or no damage from scavengers or predators. Also related to this tsunami was a dense dinosaur bone bed on the Cretaceous–Paleogene boundary found in Patagonia. ^ a b c Durand-Manterola, H. J.; Cordero-Tercero, G. (2014). "Assessments of the energy, mass and size of the Chicxulub Impactor". arXiv:1403.6391 [astro-ph.EP]. ^ a b c d e St. Fleur, Nicholas (17 November 2016). "Drilling Into the Chicxulub Crater, Ground Zero of the Dinosaur Extinction". The New York Times. Retrieved 4 November 2017. ^ a b c Bates. ^ Hildebrand, Penfield, et al. ^ Pope, Baines, et al. ^ "Dinosaur extinction: Scientists estimate 'most accurate' date". BBC News. ^ a b Amos, Jonathan (15 May 2017). "Dinosaur asteroid hit 'worst possible place'". BBC News, Science and Environment. Retrieved 19 August 2017. ^ a b Bryant, Edward (June 2014). Tsunami: The Underrated Hazard. Springer. p. 178. ISBN 978-3-319-06133-7. ^ Palmer, Jane (February 25, 2016). "We Finally Know How Much the Dino-Killing Asteroid Reshaped Earth". Smithsonian.com. Smithsonian Institution. Retrieved February 26, 2016. ^ Melosh. "On the ground, you would feel an effect similar to an oven on broil, lasting for about an hour [...] causing global forest fires." ^ Hildebrand, Penfield, et al. ; 5. ^ Pope, Ocampo, et al. ^ Lomax, B.; Beerling D.; Upchurch Jr. G.; Otto-Bliesner B. (2001). "Rapid (10-yr) recovery of terrestrial productivity in a simulation study of the terminal Cretaceous impact event". Earth and Planetary Science Letters. 192 (2): 137–144. Bibcode:2001E&PSL.192..137L. doi:10.1016/S0012-821X(01)00447-2. Retrieved May 8, 2010. ^ Marc Airhart (January 1, 2008). "Seismic Images Show Dinosaur-Killing Meteor Made Bigger Splash". ^ Hildebrand, Penfield, et al. ; 1. ^ a b Hildebrand, Penfield, et al. ; 3. ^ a b Hildebrand, Penfield, et al. ; 4. 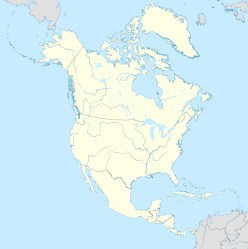 ^ "Meteor Impact Site – Earth: The biography". National Geographic. July 11, 2008. Retrieved August 19, 2015. ^ Kring, "Discovering the Crater". ^ a b Bottke, Vokrouhlicky, Nesvorny. ^ Plotner, Tammy (2011). "Did Asteroid Baptistina Kill the Dinosaurs? Think other WISE..." Universe Today. Retrieved September 19, 2011. ^ Reuters Editorial (February 2, 2010). "Smashed asteroids may be related to dinosaur killer". Reuters. ^ a b Renne, Paul (8 February 2013). "Time Scales of Critical Events Around the Cretaceous-Paleogene Boundary" (PDF). Science. 339 (6120): 684–7. Bibcode:2013Sci...339..684R. doi:10.1126/science.1230492. PMID 23393261. ^ Kyte, Frank T.; Zhiming Zhou; John T. Wasson (1981). "High noble metal concentrations in a late Pliocene sediment". Nature. 292 (5822): 417–420. Bibcode:1981Natur.292..417K. doi:10.1038/292417a0. ISSN 0028-0836. ^ Gersonde, R.; F. T. Kyte; T. Frederichs; U. Bleil; H. W. Schenke; G. Kuhn (2005). "The late Pliocene impact of the Eltanin asteroid into the Southern Ocean – Documentation and environmental consequences" (PDF). Geophysical Research Abstracts. European Geosciences Union. Retrieved 8 October 2012. ^ "Stunning discovery offers glimpse of minutes following 'dinosaur-killer' Chicxulub impact". 2019-03-29. Retrieved 2019-04-10. ^ "Fossil Site Reveals Day That Meteor Hit Earth and, Maybe, Wiped Out Dinosaurs". 2019-03-29. Retrieved 2019-04-10. ^ Riddle, Dawne (December 2009). "Silverpit "not crater"". Geological Society of London. Retrieved April 10, 2013. ^ a b Mullen, "Multiple Impacts". ^ a b c "Mass extinctions: I am become Death, destroyer of worlds". The Economist. October 22, 2009. Retrieved October 24, 2009. ^ a b de Régules, Sergio (September 2015). "Revisiting the crater of doom". Physics World. 28 (9): 33–36. Bibcode:2015PhyW...28i..33D. doi:10.1088/2058-7058/28/9/35. ^ "ESO – Chicxulub K-Pg Impact Crater Expedition 364". Archived from the original on May 10, 2016. ^ a b Amos, Jonathan (25 May 2016). "Chicxulub 'dinosaur' crater drill project declared a success". BBC News. Retrieved 2016-05-25. ^ "DOSECC High Quality Core Drilling & Exploration Services". ^ "Liftboat Myrtle – Self-Elevating Vessel – Offshore Liftboat Services – Montco Offshore Liftboats". ^ Amos, Jonathan (5 April 2016). "Project to drill into 'dinosaur crater' gets under way". BBC News. Retrieved 2016-04-05. ^ a b c d Chicxulub and the Exploration of Large Peak-Ring Impact Craters through Scientific Drilling (PDF). David A. Kring, Philippe Claeys, Sean P.S. Gulick, Joanna V. Morgan, and Gareth S. Collins. The Geological Society of America. 2017. ^ St. Fleur, Nicholas. "Drilling Into the Chicxulub Crater, Ground Zero of the Dinosaur Extinction". The New York Times. Retrieved 19 November 2016. ^ a b Hand, Eric (17 November 2016). "Updated: Drilling of dinosaur-killing impact crater explains buried circular hills". Scientific American. Retrieved 4 November 2017. Adamsky, Viktor; Smirnov, Yuri (1994). "Moscow's Biggest Bomb: the 50-Megaton Test of October 1961" (PDF). Cold War International History Project Bulletin (4): 3, 19–21. Archived from the original (PDF) on August 26, 2000. Alvarez, W.; Alvarez, L.W. ; Asaro, F.; Michel, H.V. (1979). "Anomalous iridium levels at the Cretaceous/Tertiary boundary at Gubbio, Italy: Negative results of tests for a supernova origin". In Christensen, W.K. ; Birkelund, T. Cretaceous/Tertiary Boundary Events Symposium. 2. University of Copenhagen. p. 69. Bates, Robin (series producer), Chesmar, Terri and Baniewicz, Rich (associate producers) (1992). The Dinosaurs! Episode 4: "Death of the Dinosaur" (TV-series). PBS Video, WHYY-TV. Bakker, Robert T. Interview: The Dinosaurs: Death of the Dinosaur. 1990, WHYY. Hildebrand, Alan. Interview: The Dinosaurs: Death of the Dinosaur. 1992, WHYY. Melosh, Gene. Interview: The Dinosaurs: Death of the Dinosaur. 1992, (1990): WHYY. Moras, Florentine. Interview: The Dinosaurs: Death of the Dinosaur. 1992, (filmed 1990): WHYY. Penfield, Glen. Interview: The Dinosaurs: Death of the Dinosaur. 1992, WHYY. Bottke, W.F. ; Vokrouhlicky, D.; Nesvorny, D. (September 2007). "An asteroid breakup 160 Myr ago as the probable source of the K/T impactor" (PDF). Nature. 449 (7158): 23–25. Bibcode:2007Natur.449...48B. doi:10.1038/nature06070. PMID 17805288. Retrieved October 3, 2007. Bralower, Timothy J.; Paull, Charles K.; Leckie, R. Mark (April 1998). "The Cretaceous–Tertiary boundary cocktail: Chicxulub impact triggers margin collapse and extensive sediment gravity flows" (PDF). Geology. 26 (4): 331–334. Bibcode:1998Geo....26..331B. doi:10.1130/0091-7613(1998)026<0331:tctbcc>2.3.co;2. Archived from the original (PDF) on November 28, 2007. Retrieved September 25, 2007. Covey, C; et al. (1994). "Global climatic effects of atmospheric dust from an asteroid or comet impact on Earth". Global and Planetary Change. 9 (3–4): 263. Bibcode:1994GPC.....9..263C. doi:10.1016/0921-8181(94)90020-5. DePalma, Robert A. (2019). "A seismically induced onshore surge deposit at the KPg boundary, North Dakota" (PDF). pnas.org. Retrieved April 3, 2019. Dunham, Will (November 30, 2006). "Single massive asteroid wiped out dinosaurs: study". physadvice.net. Archived from the original on October 17, 2015. Retrieved September 29, 2007. Frankel, Charles (1999). The End of the Dinosaurs: Chicxulub Crater and Mass Extinctions. Cambridge University Press. p. 236. ISBN 978-0-521-47447-4. Grieve, R. (1975). "Petrology and Chemistry of the Impact Melt at Mistastin Lake Crater". Geological Society of America Bulletin. 86 (12): 1617–1629. Bibcode:1975GSAB...86.1617G. doi:10.1130/0016-7606(1975)86<1617:PACOTI>2.0.CO;2. Hildebrand, Alan R.; Penfield, Glen T.; Kring, David A.; Pilkington, Mark; Zanoguera, Antonio Camargo; Jacobsen, Stein B.; Boynton, William V. (September 1991). "Chicxulub Crater; a possible Cretaceous/Tertiary boundary impact crater on the Yucatan Peninsula, Mexico". Geology. 19 (9): 867–871. Bibcode:1991Geo....19..867H. doi:10.1130/0091-7613(1991)019<0867:CCAPCT>2.3.CO;2. Ingham, Richard (September 5, 2007). "Traced: The asteroid breakup that wiped out the dinosaurs". AFP. Archived from the original on November 14, 2007. Retrieved September 27, 2007. Keller, Gerta; Adatte, Thierry; Berner, Zsolt; Harting, Markus; Baum, Gerald; Prauss, Michael; Tantawy, Abdel; Stueben, Doris (2007). "Chicxulub impact predates K–T boundary: New evidence from Brazos, Texas" (PDF). Earth and Planetary Science Letters. 255 (3–4): 339–356. Bibcode:2007E&PSL.255..339K. doi:10.1016/j.epsl.2006.12.026. Archived from the original (PDF) on June 23, 2007. Retrieved September 25, 2007. Kelley, Simon P.; Gurov, Eugene (2002). "The Boltysh, another end-Cretaceous impact". Meteoritics & Planetary Science. 37 (8): 1031–1043. Bibcode:2002M&PS...37.1031K. doi:10.1111/j.1945-5100.2002.tb00875.x. Archived from the original on September 5, 2008. Kring, David A. (2003). "Environmental consequences of impact cratering events as a function of ambient conditions on Earth". Astrobiology. 3 (1): 133–152. Bibcode:2003AsBio...3..133K. doi:10.1089/153110703321632471. PMID 12809133. Kring, David A. "Discovering the Crater". lpl.arizona.edu. Archived from the original on October 10, 2007. Retrieved October 12, 2007. Mason, Moya K. (2007). "In Search of a Key Paper". moyak.com. Retrieved April 3, 2009. Mayell, Hillary (May 15, 2005). "Asteroid Rained Glass Over Entire Earth, Scientists Say". National Geographic News. Retrieved October 1, 2007. Mullen, Leslie (November 4, 2004). "Deep Impact – Shiva: Another K–T Impact?". Astrobiology Magazine. Retrieved September 29, 2007. Mullen, Leslie (October 21, 2004). "Did Multiple Impacts Pummel Earth 35 Million Years Ago?". spacedaily.com. Retrieved September 29, 2007. Perlman, David (September 6, 2007). "Scientists say they know where dinosaur-killing asteroid came from". San Francisco Chronicle. Retrieved October 3, 2007. Pope KO; Baines KH; Ocampo AC; Ivanov BA (1997). "Energy, volatile production, and climatic effects of the Chicxulub Cretaceous/Tertiary impact". Journal of Geophysical Research. 102 (E9): 245–64. Bibcode:1997JGR...10221645P. doi:10.1029/97JE01743. PMID 11541145. Pope KO; Ocampo AC; Kinsland GL; Smith R (1996). "Surface expression of the Chicxulub crater". Geology. 24 (6): 527–30. Bibcode:1996Geo....24..527P. doi:10.1130/0091-7613(1996)024<0527:SEOTCC>2.3.CO;2. PMID 11539331. Qivx Inc. (2003). "Periodic Table: Properties of Iridium". qivx.com. Archived from the original on September 28, 2007. Retrieved September 25, 2007. Renne, PR; Ludwig, KR; Karner, DB (2000). "Progress and challenges in geochronology". Science Progress. 83: 107–121. PMID 10800377. Rincon, Paul (March 4, 2010). "Dinosaur extinction link to crater confirmed". BBC. Retrieved March 5, 2010. Rojas-Consuegra, R.; M. A. Iturralde-Vinent; C. Díaz-Otero & D. García-Delgado (2005). "Significación paleogeográfica de la brecha basal del Límite K/T en Loma Dos Hermanas (Loma del Capiro), en Santa Clara, provincia de Villa Clara. I Convención Cubana de Ciencias de la Tierra". Geociencias. 8 (6): 1–9. ISBN 978-959-7117-03-2. Schulte, P.; Alegret, L.; Arenillas, I.; Arz, J. A.; Barton, P. J.; Bown, P. R.; Bralower, T. J.; Christeson, G. L.; et al. (5 March 2010). "The Chicxulub Asteroid Impact and Mass Extinction at the Cretaceous-Paleogene Boundary". Science. 327 (5970): 1214–1218. Bibcode:2010Sci...327.1214S. doi:10.1126/science.1177265. ISSN 1095-9203. PMID 20203042. Retrieved March 5, 2010. Sharpton VL; Marin LE (1997). "The Cretaceous–Tertiary impact crater and the cosmic projectile that produced it". Annals of the New York Academy of Sciences. 822 (1 Near–Earth Ob): 353–80. Bibcode:1997NYASA.822..353S. doi:10.1111/j.1749-6632.1997.tb48351.x. PMID 11543120. Stewart, S. A.; Allen, P.J. (2005). "3D seismic reflection mapping of the Silverpit multi-ringed crater, North Sea". Geological Society of America Bulletin. 117 (3): 354–368. Bibcode:2005GSAB..117..354S. doi:10.1130/B25591.1. Stewart S. A.; Allen P. J. (2002). "A 20-km-diameter multi-ringed impact structure in the North Sea". Nature. 418 (6897): 520–3. Bibcode:2002Natur.418..520S. doi:10.1038/nature00914. PMID 12152076. Than, Ker (November 28, 2006). "Study: Single Meteorite Impact Killed Dinosaurs". livescience.com. Retrieved September 29, 2007. Verschuur; Gerrit L. (1996). Impact! : The Threat of Comets and Asteroids. Oxford University Press (U.S.). ISBN 978-0-19-511919-0. Web Elements (2007). "Geological Abundances". webelements.com. Retrieved September 26, 2007. Weinreb, David B. (March 2002). "Catastrophic Events in the History of Life: Toward a New Understanding of Mass Extinctions in the Fossil Record – Part I". jyi.org. Archived from the original on October 18, 2007. Retrieved October 3, 2007. Weisstein, Eric W. (2007). "Eric Weisstein's World of Physics – Roche Limit". scienceworld.wolfram.com. Retrieved September 5, 2007. Schulte, P.; Alegret, L.; Arenillas, I.; et al. (2010). "The Chicxulub Asteroid Impact and Mass Extinction at the Cretaceous-Paleogene Boundary" (PDF). Science. 327 (5970): 1214–18. Bibcode:2010Sci...327.1214S. doi:10.1126/science.1177265. ISSN 0036-8075. PMID 20203042. Archived from the original (PDF) on December 9, 2011. Retrieved 9 December 2016. Wikimedia Commons has media related to Chicxulub crater.